Hardelot - Merlimont K.V.A. D1. Wn03 Plage au sud, StP Dannes StP Ste-Cecile H.K.B StP Gabriel StP Atlantik Touquet sud H.K.B. StP Ruine Batterie 6./A.R.149. PART1. StP Ruine Batterie 6./A.R.149. PART2. Berck - Le Crotoy K.V.A. D2. StP Berck La Fourche H.K.B. Stp la Folie, Berck est. Stp Colline Beaumont & StP Mont De La Motte. Stp St Firmin Bihen H.K.B. CWGC Le Tréport Militery Cemetry. Wn Trou09 Fort de Criqueboeuf. Wn Trou012 Villerville les Hautes Bruyéres H.K.B. Wn12 Ouistreham Cháteau d’eau "Daimler"
(Utah Beach) Three day Tour of Utah and Cherbourg east area. Wn22 Quinéville Mt Coquerel H.K.B. Wn347 Hameau de Bas, Peilstand/SK (E.Batt 685). Wn349 Auderville la Roche Luftwaffe Station "Ammer"
Wn351 Auderville la Roche H.K.B. 1./1262 "Stahl"
Ra144 Le Tertre aux scenes. Ra155 Ville es Mesneirs, 'Battr. Kahlenbach'. Ra230 Fort De La Cité D'Aleth outer defence. Ra276 Grand Bé Batterie 2./M.A.A.608. Mo94 Roscoff pointe de Bloscan. Re305 Batterie MKB 'Von Holtzendorf', AA Batt. 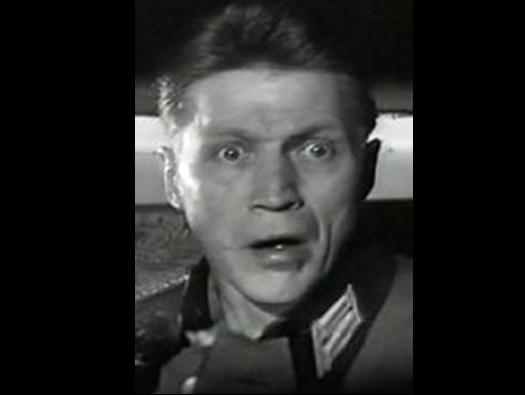 'Arnika'. Re303 Batterie 'Graf Spee' M.A.A. Wn Va56 Damgan Plage Centre. Gi301 Pointe de Grave 'Koblenz' H.K.B. Gi307 Les Arros 'Reichenberg' M.K.B. Gi307 Les Arros 'Reichenberg' M.K.B. F.C.P. Chain Home 18 Radar, RAF Trerew, Conwall. Wn59 Ste-Honorine-des-Pertes, K.V.U. 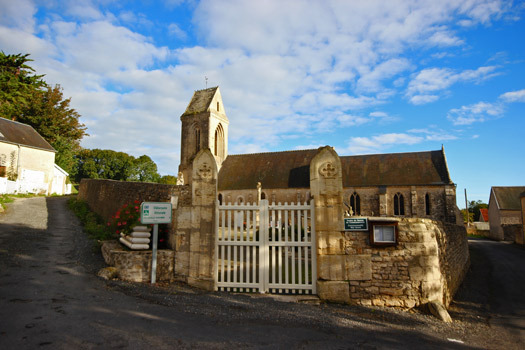 Bessin, Normandie. 3rd Company, Grenadier Regiment 726. 1 x Pz. T(f) Renault R5 turret. This photo was taken from a small American Cub spotter plane some time in 1944, probably just after the village was captured. 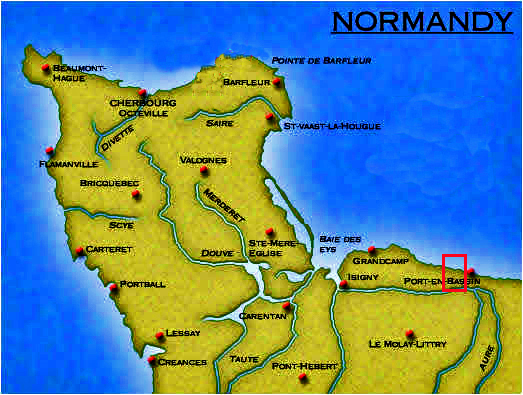 To the right flank of Omaha Beach, Wn59 is the Wn that was not attacked on D-day but was taken later when the American's were joining up with British Commandos in Port-en Bessin. There would possibly be a Belgian gate with two concrete posts either side with the gate locked in place. It could then be wheeled out and fishermen or soldiers access to the beach. Plan of how they would be used.. Concrete road block that a Belgian gate would lock into. Looking west along the beach with Wn59 up on the cliff above. How the beach may have looked with all its defences in place. 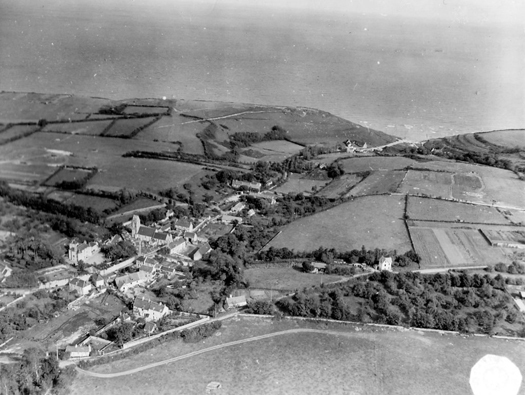 Now looking east and there would have been plenty of barbed wire, hedgehogs, Belgian Gates and mines along the beach. Barbed wire being strung out. Belgian gate being pushed into place. Trench working up the hill. Foot path access to the cliff walk. The house used in one of the opening sequences of 'The Longest Day' film. And Gert Fröbe on his horse. Tobruk with an attached tank turret bolted on the top by a ring of threads seen in the top picture. Pz. T(f) Renault R5 turret. R5 turret 3.7cm main gun and a co-axle machine gun. Tobruk with the R35 turret. Note the bolts holding the turret down. Trenches continuing up the hill. This could be a mortar pit or a machine gun post. The view down into the village. The trench running down the hill. Commonwealth War Graves Commission plate on the the church yard wall. The First World War French memorial. The grave of Sgt Harry Newman aged 21. 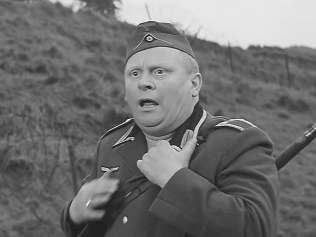 Sgt Newman was the pilot of a Spitfire Vb in No. 234 Squadron RAF flying from RAF Warmwell on fighter sweep over the Normandy coast. Spitfire Vb the type he was flying with 234 Sqn markings at Biggin Hill 2014..
Maj. Werner Pluskat (Hans Christian Blechin in The Longest Day film). Maj. Werner Pluskat commanded 1./Art.Rgt.352 and controlled their fire onto the beaches in the area. There are lots tails of Pluskat, some say he was there and some say he was not. He survived D-day and was captured later in the war to live to a good age. Up on the cliff was a fire control post that directed the fire of III. Batt.des I. Art. Btl/352. 10.5cm FH 18/40. 10.5cm FH 18/40. 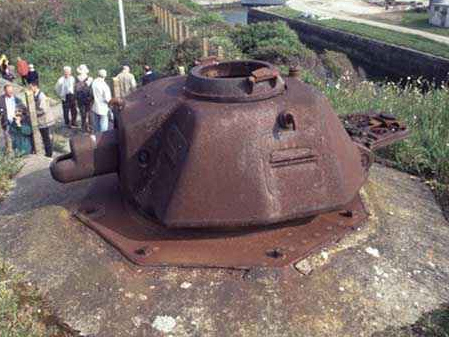 The Batteries had their scale of ammunition cut down by half just before D-day and the rest was stored inland to protect in from Allied bombing. The ammunition was being brought forward and was caught in air raid by strafing fighters and the lot was destroyed. 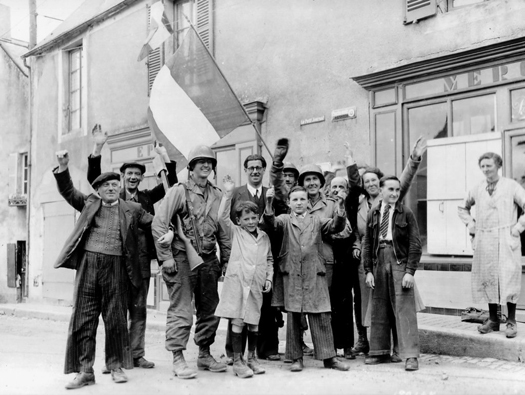 Ste-Honorine-des-Pertes after the Liberation of the village..